Shipov’s commentary in the original Russian can be found here at Crestbook, where you can also play through all the moves and analysis. Hello, dear friends! This is Grandmaster Sergey Shipov, with you to follow the next game in the Candidates Semifinals as closely as possible. Everything I notice, everything I grasp – I’ll immediately let you know in written form. I won’t hide a thing. 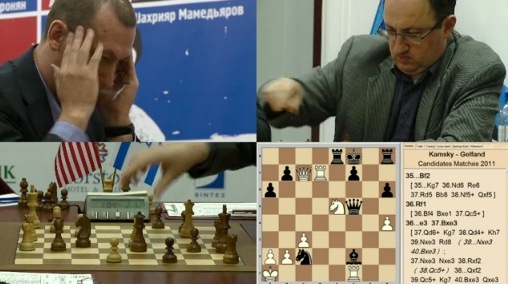 Today we’re again going to watch the struggle between Kamsky and Gelfand. They’ve got the same number of points, but different problems. Gata clearly has gaps in the opening, but he’s very strong in defence and complications. Boris, on the other hand, despite all his powerful erudition and top-class preparation, has been playing unevenly, letting good chances slip. Now if you could combine them into one player… However, they’re strong individually as well. And one of them will get into the final alone. 1. e4 c5 2. Nf3 d6 3. d4 cxd4 4. Nxd4 Nf6 5. Nc3 a6 The opening duel in the Najdorf Variation of the Sicilian Defence continues. 6. Be3 e5 7. Nb3 And here’s a small change. 7…Be7 Gelfand replied very quickly. He was also, of course, prepared for that entirely standard move. 8…Be6 On the one hand, this hints at the d6-d5 break. On the other hand – it’s simply development. 9…Nbd7 The most harmonious set-up for the black pieces. The invasion of the white knight on d5 isn’t dangerous. True, the knight on d7 takes away a square which could have come in handy for a retreat by its brother on f6. Therefore the g2-g4 push has gained in strength. A logical rebuttal. The outline of the struggle is becoming clear. 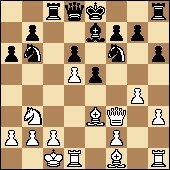 White is intending to castle long and mate. The clocks are, for now, atypical of Kamsky: 1:43 – 1:24. There’s the advantage of an opening surprise! It allows you to win at least half an hour on the clock. 10…h6 You don’t want to put the knight on b6 while the pawn’s on b7. It’s simply ugly to switch the f6-knight to e8. Therefore you have to weaken the kingside. 11. 0-0-0 After this White intends to continue the pawn storm. For example, with Rh1-g1, h3-h4 and g4-g5. 11…Rc8 It seems the idea of the exchange sac on c3 also appeals to Gelfand. As you recall, that was the blow he used in his victorious game against Mamedyarov. 12. Nd5 Kamsky has found a fundamental response to his opponent’s threat – and in turn he’s plotting an attack in the centre. 12…Bxd5 It was impossible to tolerate such impudence. A useful manoeuvre. Note that Black is keeping his king in the centre for now – that’s the safest place. The knight is heading to c4. You won’t believe it, but nothing new has happened yet. The players are following a known path, and of course their home preparation. 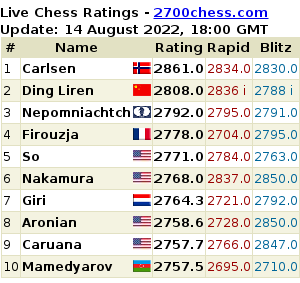 That’s particularly the case with the American grandmaster, while it’s entirely possible the Israeli is already playing on his own. He’s seeking and finding logical positional solutions. 14. h4 It seems as though this attack is a little premature. It’s a novelty. Gata thought for so long that there are no longer any doubts – he’s also acting alone, without the help of any theoretical crutches. The most interesting question here is how deeply he calculated the line 14…Qc7 15. c3 Nbxd5! Who to be, or not to be, here depends on that. In that line (after 16. Rxd5 the pin 16…Qc6! is planned, and if 17. Bg2 there’s also 17…e4!) wild and unclear complications begin, with all three results possible. 14…Qc7 Yes! Boris has stumbled upon the correct path. The other continuations were too passive and allowed White to develop a threatening attack. 15. c3 Gata doesn’t blunder mate-in-one. It happened! Now the direct line with captures leads to a position where Black is up the exchange but White has compensation. There’s also the modest retreat 16. 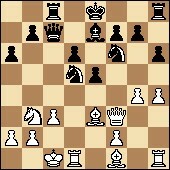 Bd2, which again gives White compensation, but in exchange for a pawn. 16. Bd2 A very quick reply. It seems as though Kamsky had foreseen all of this. White is ready to develop a threatening initiative in the centre and on the kingside. 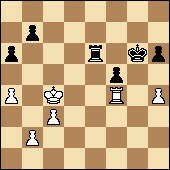 Black has weak light squares and an uncastled king. The clocks show: 1:09 – 0:42. 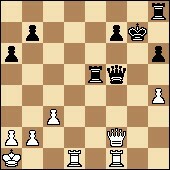 17. g5 White is successfully developing an attack. Including the f1-bishop will double the storm’s force. 18. gxh6 Correct. It’s worth clarifying the structure. 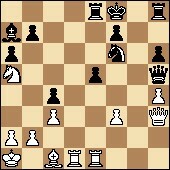 So then, White has good paths to the black king: the h3-c8 diagonal and the g-file. 19. Kb1 Subtle. It seems as though Kamsky is intending to withdraw his bishop to c1 and activate his knight via b3 to d2. 19…Qc6 Gelfand instantly exploits the flaw in the move order chosen by his opponent. 20. Qh3 Making sure not to lose the rook, the queen has taken a good square away from the bishop. On the other hand, g2 also won’t be bad for it. 20…d5 A powerful continuation. Black is rushing to seize the key heights in the centre while his main enemy is still resting on f1. However, there’s a serious drawback to the move selected. Reinforcing the light squares, Black is weakening the squares of the other colour. Now 21. f4! is asking to be played, opening up the d4-square. The currently passive b3-knight can settle there. Let’s look at the clocks: 0:45 – 0:30. 21. Be2 Also a reasonable move. You have to complete development, one way or another. The question of how to break up Black’s centre can be left to later, as Black doesn’t, in any case, have a clear plan of action. 21…Nc4 Boris has started to play quickly and confidently. He clearly doesn’t want to end up in serious time trouble. He saw a natural positionally-justified move – and made it. 22. Bc1 Gata responds in the same manner. The invasion of the knight on c4 caused a certain unrest in the white king’s residence, but it also weakened the d5-point. 22…Nf6 There’s the response. Black strengthens the d5-point. 23. Rhe1 Kamsky is diabolically methodical! He’s gradually concentrating his forces in the centre, precisely where the enemy king has delayed – without any chance of escaping to the sidelines. He’s threatening… It’s hard to say exactly what he’s threatening. That’s what makes the position so tough to play for Black. White’s threats are unclear, but sooner or later they’ll appear. 24. Qh2 The natural and strongest response. It creates pressure against the e5-point. 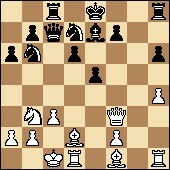 If given the chance White might simply jump with the knight to d4, beginning a sacrificial attack. Right now, for example! The Israeli grandmaster has had to take another serious think. The situation requires it. The clocks show: 0:33 – 0:19. 24…Qf5+ The cowardly queen is deserting the scaffold, leaving the king on it. 25. Ka1 Another quick and flexible move. 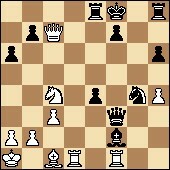 25…Kf8 No, the king’s also escaped punishment. But forever? 26.f3 Subtle. Very subtle! Kamsky has closed off the e4 and g4 points with the clear intention of playing Be2-d3. You can’t take the f3-pawn. Gelfand is reinforcing the centre as far as possible. But, alas, it’s impossible to make it really solid. The clocks are becoming an important factor: 0:28 – 0:11. It seems as though the American Champion is going to launch a decisive attack when his opponent has very little time. 27. Qg1 This manoeuvre looks too cunning. Is the invasion of the white queen on a7 really a serious threat? In my opinion, it’s in vain that Gata’s getting distracted from much more weighty goals. But I could be wrong in the heat of the moment. The American’s actions do have a practical justification – he’s being cunning and unpredictable for his opponent. 27…Bb8?! A purely reflex response. And an inaccuracy. So Kamsky’s cunning has had an effect. 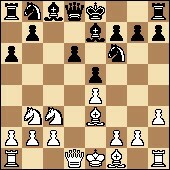 Now after the exchange on c4, and taking with the rook, the white queen will get to b6 to great effect. 28. Bd3 The players are moving much faster, and as a consequence have begun to trade inaccuracies. The position is very complex and it’s impossible to grasp it at high speed. And again a dubious choice. While covering the kingside the black queen is leaving the queenside to its fate. After the invasion of the white queen on b6 not only the b7-pawn will be under attack, but also the f6-knight. 29. Qh1? What’s going on, my friends? Gata spent a few minutes thinking – that should have been plenty in order to notice the obvious line – but he chose an amazingly passive move. 29…Ba7 An excellent manoeuvre, depriving the white pieces of important squares. 30. Qh3 A one-move attack – on c8. 30…Re8 Boris isn’t blundering for now. 31. Bxc4 Finally Gata’s decided to attack. The position is opening up and becoming a street brawl. With the unrelenting clocks ticking away: 0:14 – 0:07. 34. 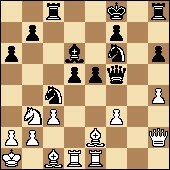 Qh2 Only with queens on the board does White have a chance of continuing the storm. After all, for now the black king is bad and the rook on h8 is taking a rest. 34…Ng4 A good manoeuvre. Black is ready to set up a reliable shield on f2 if the white rook appears on f1. 35. Qc7 The best move. It threatens not so much the capture on b7, but Nc4-d6. 35…Bf2 While Kamsky was thinking Gelfand also managed to plan the strongest move! Everything else led to unpleasant consequences. I’ll note a breakthrough moment: Gata now has less time on the clock: 0:03 – 0:04. It never rains but it pours. Having missed a series of favourable possibilities, Gata is losing the thread of the game. 36…e3 The black pawn is pressurising White, like a press. 37. Bxe3? A new mistake. 37…Nxe3 Black has an extra piece. Checks by the white queen don’t give anything. 38. Ne5 A good chance. 39. Qc5+! Kg7 40. Qxe3 White has successfully won back the piece and regained chances of… of a positive result. In any case, he’s no longer losing! The nervous time trouble is over. We’ll drink coffee and get away from what we’ve gone through! The position appears to have equalised – which was to be expected under my wise leadership :) (Translator’s note: see Shipov’s summary at the end of yesterday’s game!) 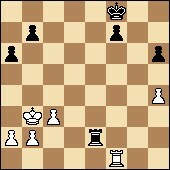 By the way, White’s last move was also a new inaccuracy! Although it was already the 41st move. It seems as though Gata simply wasn’t able to stop in time. And in the ending real problems might await him – the h4-pawn is weak, and the black passed pawn on f7, on the contrary, is very promising. 41…Qxf2 42. Rxf2 Rhe8 Black is already prepared for active measures. White, it seems, needs to activate his king immediately. Or things will get bad. 43. Rg1+ Played after 20 minutes’ relaxation. Of course, it’s useful to push the black king back a little. After that you can take care of your own. 43…Kf8 Now it’s worth looking at 44. 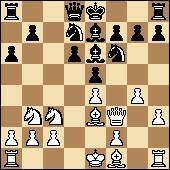 Kb1 or pushing the pawns on a2 or b2. Correct. If the white king manages to creep to the centre, then White’s defences will hold. 44…Re2 An attempt to cut off the creeper. 45…R8e4 While, on the contrary, that attack appeals to Boris. It would be nice to take the h4-pawn. 46…Re1+ We’ve ended up with a beautiful rectangle of rooks. Just for a moment. 47. Kc2 No, for two. 48. Kb3 Solid and strong. Now there are lines with an extremely interesting passed-pawn race – when Black takes on h4, and White on b7. In analysis it turns out to be approximately equal, but in practice Black’s chances are higher. The headcount of rooks has halved. Black can choose between attacking the h4-pawn or activating his king. Times: 0:21 – 0:37. 49…Kg7 Activating his king and prophylaxis combined. 50. Rf4 A reliable construction that prevents both the advance of Black’s passed pawn and the king on g7 getting out into the world. It can only be destroyed by offering to enter various types of pawn ending. And at first glance, with normal play from both sides, they all lead to a draw. 50…Re6 Gelfand is being cautious. 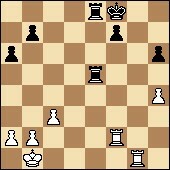 51. a4 Kamsky is, as they say, revealing his aces. If he manages to advance the queenside pawns then the advantage will switch to White. White’s progress is obvious. He’s out of danger. 53. a5 Gata is ready to exchange rooks, which will, as before, lead to a draw. 53…Kf6 Boris is hoping to bring his king to e5. 54. Kd3 Strange as it seems, no resistance is being put up to that idea. 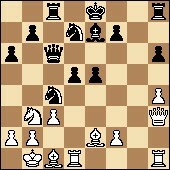 However, White has a counter-idea – switching the rook to b4 to put pressure on b7. 54…Re7 DRAW! This was a memorable and very dramatic encounter. It seems to me I’ve redeemed my commentator’s guilt in regard to Gelfand and his supporters. The course of the game was unfavourable for Boris. He didn’t equalise after the opening, came under an attack, and got into time trouble. And then we had the most interesting part of the game – wild swings in evaluation from +- to -+. With their flags about to fall the players made mistakes in unison and the position miraculously equalised. In general, you could say that both players got lucky, to a degree. So then, the balance of the match has been preserved. Tomorrow we’ll have the last game at the classical time control. On that note, this is me, Grandmaster Sergey Shipov, ending this fascinating report. All the best and see you tomorrow! Although Sergey “fulfilled his duty” by describing the Grischuk – Kramnik draw, and admitted they were playing “good, accurate chess”, it’s fair to say he did it without any great enthusiasm. The more interesting part of the video is where Shipov again looks at Kamsky – Gelfand (from about 07:30 on). He slightly changed his mind on some of the statements in the commentary above, for instance concluding that 14. h4 by Kamsky was a “deep and promising idea”. 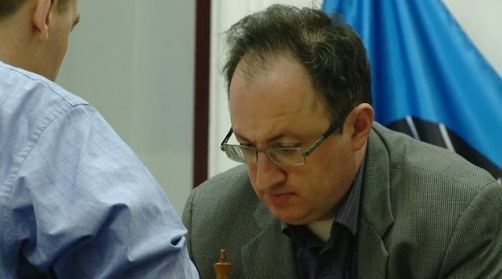 Gelfand might have been better off trying 16…Nb4!? Shipov demonstrates the missed wins by both players – at 17:35 you can see the “obvious and logical” 29. 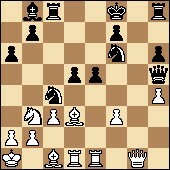 Bxc4 for Kamsky instead of the “absolutely awful move” 29. Qh1. Or at about 21:10 Shipov starts talking about 38…Qh5 for Gelfand instead of 28…Qf5. He shows why 39. Nd7+, the move Kamsky suggested at the press conference when the journalists told him about the win, doesn’t work (there was still a tricky move or two to find with a couple of minutes on the clock!). Please, let me suggest you that there is a mistake in your comment at move 50…Re6 in game ‘Kamsky – Gelfand’ Semis 3. By the way, I want to thank you sincerely for all your excellent reports. Hi Roberto, and thanks for the comments! I’m only the translator of Sergey Shipov’s Russian, but I think you might have a piece on the wrong square – as after 65. b6 Black just plays …Kd6, then …c5 and the king can always take White’s pawn. The only question would be whether the c-pawn allows Black to win instead.